San Francisco Bay, one of the world's finest natural harbors and a major center for maritime trade, is referred to as the "Gateway to the Pacific Rim." The bay is an urbanized estuary that is considered by many to be the major estuary in the United States most modified by man's activities. The population around the estuary has grown rapidly since the 1850's and now exceeds 7 million people. The San Francisco Bay area's economy ranks as one of the largest in the world, larger even than that of many countries. More than 10 million tourists are estimated to visit the bay region each year. The bay area's population and associated development have increasingly changed the estuary and its environment. San Francisco Bay and the contiguous Sacramento-San Joaquin Delta encompass roughly 1,600 square miles (4,100 km2) and are the outlet of a major watershed that drains more than 40 percent of the land area of the State of California. This watershed provides drinking water for 20 million people (two thirds of the State's population) and irrigates 4.5 million acres of farmland and ranchland. 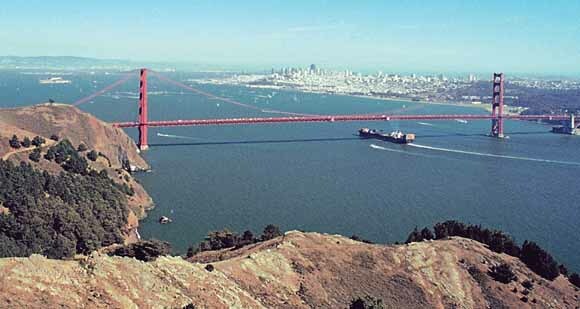 During the past several decades, much has been done to clean up the environment and waters of San Francisco Bay. Conservationist groups have even bought many areas on the margins of the bay with the intention of restoring them to a condition more like the natural marshes they once were. However, many of the major manmade changes to the bay's environment occurred so long ago that the nature of them has been forgotten. In addition, many changes continue to occur today, such as the introduction of exotic species and the loss of commercial and sport fisheries because of declining fish populations. The economy and population of the nine counties that surround the bay continue to grow and put increasing pressure on the bay, both direct and indirect. Therefore, there are mixed signals for the future health and welfare of San Francisco Bay. The San Francisco Bay estuary consists of three subembaymentsnorth bay (San Pablo and Suisun Bays), central bay, and south bayeach characterized by a central area of open water surrounded by intertidal mudflats and marshes. Central bay includes Alcatraz and Angel Islands and also a number of submerged bedrock knobs that protrude through the sediment of the bay floor and rise to within about 40 feet (12 m) of the water surface. The most prominent of these are Harding, Shag, Arch, and Blossom Rocks. These rocks have been lowered by blasting several times in the past, but they remain a potential hazard to shipping because newer cargo vessels are designed with increasingly deeper drafts. Central bay's location adjacent to two major population and commerce centers, San Francisco and Oakland, subjects it to greater human influences than less developed parts of the estuary. The western part of central San Francisco Bay is adjacent to the Golden Gate, the estuary's outlet to the Pacific Ocean. The changing submarine topography of the west-central bay, as well as its geology, form the main focus of this book. Download the map supplement for this report as a PDF document (4.2 MB). This sheet is 26" x 36" and can be printed on a plotter. You can also pan and zoom on the screen. One of the images on this sheet is a 3D view for which you will need red-blue 3D glasses. The paper version of this publication comes equipped with these (ordering information below).